(Francisco Kjolseth | The Salt Lake Tribune) A mixture of local pros and nationwide travelers make their annual attempt to qualify for the Utah Championship on the Web.com Tour as they play at Talons Cove Golf Course in Saratoga Springs on Monday, July 7, 2018, for a shot to play in a PGA Tour-brand event. Only 12 players advance from a field of roughly 140. (Francisco Kjolseth | The Salt Lake Tribune) A mixture of local pros and nationwide travelers make their annual attempt to qualifying for the Utah Championship on the Web.com Tour and a shot to play in a PGA Tour-brand event at Talons Cove Golf Course in Saratoga Springs on Monday, July 7, 2018. Only 12 players advance from a field of roughly 140. (Francisco Kjolseth | The Salt Lake Tribune) Zach Johnson of Farmington reacts to a close shot on the 18th hole as he joins a mixture of local pros and nationwide travelers make their annual attempt to qualifying for the Utah Championship on the Web.com Tour and a shot to play in a PGA Tour-brand event at Talons Cove Golf Course in Saratoga Springs on Monday, July 7, 2018. Only 12 players advance from a field of roughly 140. (Francisco Kjolseth | The Salt Lake Tribune) Gipper Finau of St. George wraps up his first round of golf during the Utah Championship on the Web.com Tour at Talons Cove Golf Course in Saratoga Springs on Monday, July 7, 2018. Only 12 players advance from a field of roughly 140. (Francisco Kjolseth | The Salt Lake Tribune) Dalton Stanger of Orem finishes his first nine as he joins a mixture of local pros and nationwide travelers making their annual attempt to qualifying for the Utah Championship on the Web.com Tour and a shot to play in a PGA Tour-brand event at Talons Cove Golf Course in Saratoga Springs on Monday, July 7, 2018. Only 12 players advance from a field of roughly 140. (Francisco Kjolseth | The Salt Lake Tribune) A mixture of local pros and nationwide travelers make their annual attempt to qualifying for the Utah Championship on the Web.com Tour and a shot to play in a PGA Tour-brand event at Talons Cove Golf Course in Saratoga Springs on Monday, July 7, 2018. Only 12 players advance from a field of roughly 140. (Francisco Kjolseth | The Salt Lake Tribune) Garrett Fotu of Centerville joins a mixture of local pros and nationwide travelers as they make their annual attempt to qualify for the Utah Championship on the Web.com Tour and a shot to play in a PGA Tour-brand event at Talons Cove Golf Course in Saratoga Springs on Monday, July 7, 2018. Only 12 players advance from a field of roughly 140. (Francisco Kjolseth | The Salt Lake Tribune) Trenton Twamley of Murrieta, CA, rakes the sand trap following a frustrating finish on his first nine as he joins a mixture of local pros and nationwide travelers making their annual attempt to qualifying for the Utah Championship on the Web.com Tour and a shot to play in a PGA Tour-brand event at Talons Cove Golf Course in Saratoga Springs on Monday, July 7, 2018. Only 12 players advance from a field of roughly 140. (Francisco Kjolseth | The Salt Lake Tribune) Ray Beaufils of Scottsdale, AZ, lowers his sights for a final stroke as he joins a mixture of local pros and nationwide travelers attempting to qualifying for the Utah Championship on the Web.com Tour and a shot to play in a PGA Tour-brand event at Talons Cove Golf Course in Saratoga Springs on Monday, July 7, 2018. Only 12 players advance from a field of roughly 140. (Francisco Kjolseth | The Salt Lake Tribune) Under a dramatic sky, local pros and nationwide travelers make their annual attempt to qualify for the Utah Championship on the Web.com Tour as they play at Talons Cove Golf Course in Saratoga Springs on Monday, July 7, 2018, for a shot to play in a PGA Tour-brand event. Only 12 players advance from a field of roughly 140. (Francisco Kjolseth | The Salt Lake Tribune) A mixture of local pros and nationwide travelers make their annual attempt to qualifying for the Utah Championship on the Web.com Tour and a shot to play in a PGA Tour-brand event at Talons Cove Golf Course in Saratoga Springs on Monday, July 7, 2018. Only 12 players advance from a field of roughly 140. (Francisco Kjolseth | The Salt Lake Tribune) Matt Baird, center, of Cedar Hills makes an attempt to qualify for the Utah Championship on the Web.com Tour and a shot to play in a PGA Tour-brand event at Talons Cove Golf Course in Saratoga Springs on Monday, July 7, 2018. Only 12 players advance from a field of roughly 140. (Francisco Kjolseth | The Salt Lake Tribune) Joe Summerhays of Syracuse focuses on the green as he joins a mixture of local pros and nationwide travelers make their annual attempt to qualifying for the Utah Championship on the Web.com Tour and a shot to play in a PGA Tour-brand event at Talons Cove Golf Course in Saratoga Springs on Monday, July 7, 2018. Only 12 players advance from a field of roughly 140. (Francisco Kjolseth | The Salt Lake Tribune) Spencer Fletcher, left, of Los Altos, CA, shakes hands with Joe Summerhays of Syracuse after a round of golf in Saratoga Springs. A mixture of local pros and nationwide travelers make their annual attempt to qualifying for the Utah Championship on the Web.com Tour and a shot to play in a PGA Tour-brand event at Talons Cove Golf Course on Monday, July 7, 2018. Only 12 players advance from a field of roughly 140. (Francisco Kjolseth | The Salt Lake Tribune) Zach Johnson of Farmington joins a mixture of local pros and nationwide travelers make their annual attempt to qualifying for the Utah Championship on the Web.com Tour and a shot to play in a PGA Tour-brand event at Talons Cove Golf Course in Saratoga Springs on Monday, July 7, 2018. Only 12 players advance from a field of roughly 140. (Francisco Kjolseth | The Salt Lake Tribune) A mixture of local pros and nationwide travelers make their annual attempt to qualifying for the Utah Championship on the Web.com Tour and a shot to play in a PGA Tour-brand event at Talons Cove Golf Course in Saratoga Springs on Monday, July 7, 2018. Only 12 players advance from a field of roughly 140. (Francisco Kjolseth | The Salt Lake Tribune) A mixture of local pros and nationwide travelers make their annual attempt to qualifying for the Utah Championship on the Web.com Tour and a shot to play in a PGA Tour-brand event at Talons Cove Golf Course in Saratoga Springs on Monday, July 7, 2018. Only 12 players advance from a field of roughly 140. (Francisco Kjolseth | The Salt Lake Tribune) A mixture of local pros and nationwide travelers make their annual attempt to qualify for the Utah Championship on the Web.com Tour as they play at Talons Cove Golf Course in Saratoga Springs on Monday, July 7, 2018, for a shot to play in a PGA Tour-brand event. Only 12 players advance from a field of roughly 140. 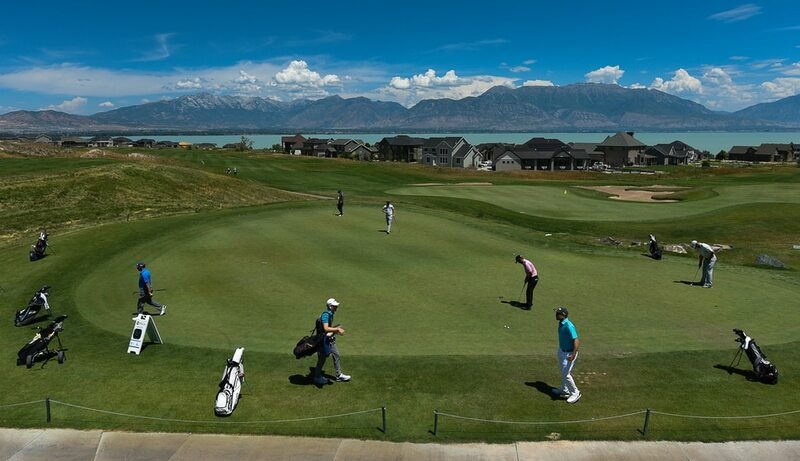 (Francisco Kjolseth | The Salt Lake Tribune) A mixture of local pros and nationwide travelers make their annual attempt to qualify for the Utah Championship on the Web.com Tour as they play at Talons Cove Golf Course in Saratoga Springs on Monday, July 7, 2018, for a shot to play in a PGA Tour-brand event. Only 12 players advance from a field of roughly 140. Saratoga Springs • The wind howled, the skies darkened and Seokwon Jeon wanted to go home. 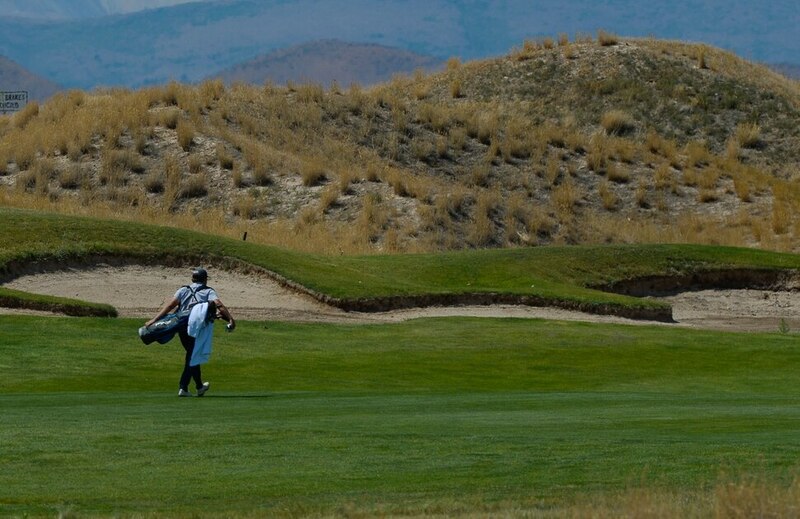 The former Hillcrest High School and Utah State golfer stood next to the 18th green of Talons Cove Golf Course late Monday evening, asking for a ruling. He had done the work of a shooting a 7-under-par 65 and parring two playoff holes, and now he was doing the math. If four spots were left in Web.com Tour’s Utah Championship qualifying event, three golfers in Jeon’s group had failed to par the second playoff hole and one player in the other remaining foursome already was headed to the clubhouse after hitting his drive out of bounds, Jeon was in the field, right? TV • Golf Channel, 5-7 p.m. Thursday-Sunday. The confirmation came from a tour official, and Jeon smiled in relief. He will play Thursday at Oakridge Country Club in the $700,000 tournament, as the only Utahn who advanced from Talons Cove. More than two dozen Utahns were in the starting field of 156, with 12 qualifiers. Jeon was among the seven players surviving the 12-man playoff, eventually lasting four holes to determine the final qualifier, Brady Sharp. His four-foot putt dropped about nine hours after Kansas pro Chase Hanna had completed a 62 in the first group off the No. 1 tee. 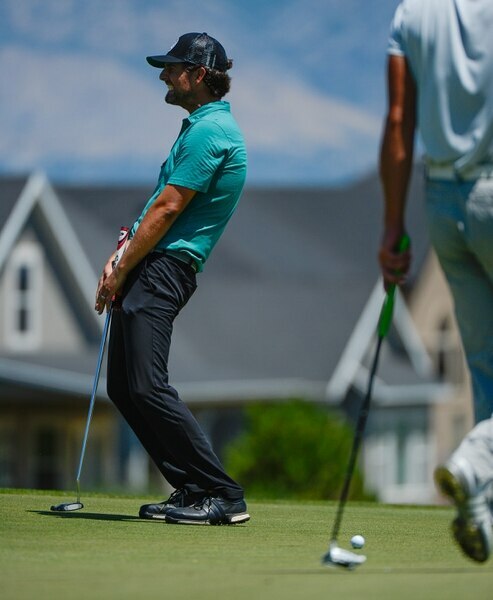 In its own way, Monday qualifying for the Utah Championship might be the most demanding sporting event on the state’s calendar. More than half of the field shot in the 60s, yet most of them were turned away. The course setup was not difficult, but Talons Cove is not as easy as these guys make it look every year. It is barely an exaggeration to say Farmington’s Zach Johnson had an easier time qualifying for this summer’s PGA Championship than trying to make the Utah Championship field. Johnson posted a 67 and tied for 29th place, having paid a $450 entry fee to play a course that offers a $30 special (with cart) on Mondays. The lure, beyond the experience of competing in a PGA Tour-brand event, is the opportunity to make money and keep playing. Just enough success stories exist to drive golfers’ hopes. In the tour’s 29-year history, 22 Monday qualifiers have won tournaments — including former BYU golfer Andy Miller, in 2002. This season, an average of three qualifiers have earned money by making the 36-hole cut; several have advanced to the next event with top-25 finishes. In 2008, ex-BYU golfer Clay Ogden earned nearly $40,000 in three weeks via two top-25s, starting in Sandy. That’s why golfers keep filling the fields at in places such as Saratoga Springs, even though the odds are staggering. PGA Tour star Tony Finau tells the story of shooting a 67 in five straight qualifiers for the Web.com Tour and missing by one shot each time. Monday qualifiers fit into three basic categories: Tour members who lack full access to events, and need every start they can get; mini-tour travelers, hoping for a break; and local pros such as Johnson and Jeon, who take a shot, without travel expenses. Ryan Sullivan attracted attention this month when he qualified for an event in Illinois, then barely missed a top-25 finish. So he hustled to the next site in New York, slept in his car for a few hours and qualified again. He missed the 36-hole cut by one stroke. That brought him to Utah, where his 69 didn’t come close in the afternoon, after his comfortable hotel stay. “Making pars isn’t going to get you into the tournament,” he said good-naturedly, while plotting his next move in an ongoing process he likens to legalized gambling. MONDAY QUALIFIERS: 62 – Chase Hanna. 63 – Neil Johnson, Nyasha Mauchaza. 64 – Kevin Lucas, Sam Love. 65 – Hans Reimers, Brady Sharp, Seokwon Jeon, Jordan Gumerg, Maxwell Cohen, Michael Tolladay, Zahkai Brown. Webster is preparing to launch The Elite Tour next spring in Phoenix, intending to give golfers another alternative to the weekly chasing of spots in Web.com Tour fields and enable them to become better prepared for the annual qualifying tournament. Yet there will likely always be golfers who take their shots on Mondays, and Jeon hopes to maximize his opportunity to play at this level. He overcame a lost-ball penalty on No. 9 by making consecutive eagles (driving the green of the par-4 No. 16) and shooting a back-nine 30. Jeon hit a clutch shot out of the rough on the second playoff hole with the wind blowing hard against him. Just this once, a par was good enough.